Obelisk Ridge is the meeting place of the whole pack, in which the leaders and the pack stays on the ridge for the whole full moon. They say that the moon gives them wisdom, because from up on the ridge, they say they are so close to it, they could almost touch the moon. Location : In the shadows >:3 <---That's EVIL <---Truly, dearest...o.o... <--- Uh, yes, truly, m'dear!! The brute's muttering touched Fiacre's auds but she thought nothing of the sound until it rose up like a sleeping beast and roared toward her. Rising to her paws, the demoness turned her frame to face the brute. Upon sturdy pillars she stood, staring into the brute's mismatched eyes. Three times within a night the blame had been directed toward her, both of the wolves were prepared to strike her over her mere presence upon the land. 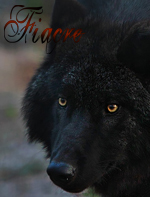 Fiacre failed to grasp what she had done or what the wolves were provoked over. It almost seemed like their anger sparked from thin air surrounding her. Why do you dwell in their lands, with such lesser beings, a voice growled, her voice a coaxing song of a lethal siren. Life would have suited you better elsewhere, these lands are yours for the hiding. Fiacre's golden pools remained bleak like frozen metal arcs. The voice, her guidance, wished her to leave. Would it be for the better to stay away and lure wolves to their inevitable fates. "The duration of my flight through these lands seems to have ended," she spoke evenly not looking away from the brute. "I bid thee luck with your snow white companion and your tormented soul. With that the wind's call carry me elsewhere, farewell Ross." Oh but we shall meet again m'dear, perhaps then you shall see you are like me, shadowed and alive. Perhaps you shall let go of what remains and join the fates. Standing frozen for a moment longer, the demoness spun away, slinking off into snow. She dared not look back upon her opponent in the woodlands, she wished not to be dragged back to the conflict. If only she had stuck to her solitude, no wonder wolves were violent to one another when their anger is projected out into the world like a poisonous mist. Ross was rigid as Fiacre padded away from him. Was everyone he cared about going to walk out of his life like Zanna and Fiacre? As if he was nothing more than a play toy? The large brute sighed, his ears flat and his eyes staring at the ground. He let out a loud, mournful howl. It sliced through the silence around him, the rustling leaves joining in his tune. His pupils shrunk as he shook his head. Trying not to let that voice take over. That voice he had pushed away long ago and locked away. But Fiacre, she seemed to be the key to that element. His red and green eyes flooded with fear. He could not let that voice control him again. Mot ever again. It what wa sled him to have a horrible past. So many secrets. Dark secrets. The woodlands around her did not feel the same as they had before. With the knowledge of other wolves upon them it felt tainted, set the deomoness on edge. Beneath her frozen pads the barren land secreted beneath the snow was torn by her talons. She enjoyed the feeling of the stubborn Earth's skin being clawed apart. The onyx hued wolf may have left the sights of the wolves but she was not going to leave their lives, there was some business she sought to settle. A brute's life she was ordered to take and she planned to do just that, to spill the blood of a foe, but it required not to be the blood of Ross, any victim would suffice her craving. Parting her ivory jaws, the demoness inhaled the frigid air, feeling it roll onto her tongue and swirl around her in a fine mist. In the near distance she heard a howl, dense with interwoven sorrow fill the air. What was the meaning of the howl bypassed the dark as night femme. She now had victims to find and survival to battle. Ross plopped down on the ground. He needed to be by himself. That, and he didn't know who to follow him. Ross began thinking. Zanna seemed pretty upset at the sight of Fiacre together, and the fear in her eyes scared him. Was there something about Fiacre that Zanna knew and he didn't? He shivered, unsure of the endless possibilities. Tell me please, why can't I? "Ach!" she screamed out loud at herself, outraged at her own thoughts. Suicide? 'A perfectly probable approach, very smart, Zanna!' she growled angrily in her mind. Slowing down from her high speeds, she sat back on her haunches with a snowy crunch, panting hard from her run. What was she doing?! Proud scot. Why think of such infuriating thoughts? She should live, not die. She should show Ross and Fiacre that she wasn't scared. She was a noble wolf! But...Would that be a lie? Of course. It was a lie. Couldn't she lie? No. No lying. That was even worse than the thought of suicide! Lying, blatantly, to people she cared for? Did she even care for Fiacre? 'This must be considered.' she thought, wrinkling her nose in contemplation. She cared for Ross. Oh yes, she would agree heartily to anyone who asked. He was true kindred spirit. He felt like her own kin. And kin cared about kin. But did enemy care for enemy? 'Of course not!' Now she was just being ridiculous. Why would an enemy care for an enemy? That made no sense to her mind. Caring, for someone who cared nothing for you? Of course not. That would be just dumb. She turned, looking with her large eyes toward the spot the cry came from. A realm of silence, solitude had been returned, laced into the onyx coat of a wolf. The creature slipped through the darkness as if she tread upon this path before, her paws unconsciously guiding her through the vast forest. A restless energy coursed through her, causing her banner to lash against the thickets of snow but the demoness cared less for the land around her. Stealthily she stalked around the ridge guided by the wide arc of its base. The winds that brushed by her whispered into her lobes, taunting her. She required a kill, to feel nothing but the lust for prey within her. A chuckle escaped the demoness's parted incisors. A hunt is what I seek, nothing more than survival nothing less than vengeance. Leaping forth, Fiacre took off through the snow, seeking for her prey. The snow that resembled the fae's white coat prickled Fiacre with annoyance. Would the wrench have returned back to the emotional fool called Ross or was continuing to take out pointless anger upon herself? A violent quiver ran through the demoness's frame, she did not care for their fates. Let the brute turn, let him be taunted by his own shadows. Fiacre snarled inwardly. He shall suffer without my aid, he shall suffer with the snow white beauty that ought to be knocked out cold than to breathe another day. Oh her corpse would make a lovely gift, tangled in decaying vines with crimson paint splattering her. A fine canvas, a statue, a warning to all those who dared threaten the demoness. It would be so simple to seek revenge, to bring down talons and fangs upon her but what damage would that inflict. It would only satisfy Fiacre's desires. No, I need a higher stakes to play a devilish game. Ross plopped down, yawning. His breath stirred aleaf by his nose. He scrambled to.his paws, staring down at the cliff in front of him. He considered he didn't have much to live for, but he couldn't do that to Zanna. Sighing the male paced back and forth. Creeping across the lands, the shadows seemed to move, revealing the onyx hues of a creature lurking within the lands. The figure's cranium moved slowly, shifting as if to stretch. She was bored, yearning to sink her claws into the flesh of a living being. When had she last seen the delightful crimson hues, she missed the tones, the rustic taste. A sigh escaped her frame as she recalled the rivers of red, each was magnificent to witness, but to be the creator of the disaster was a tale of it's own. The desire to be close with her victim, to feel the heartbeat against her skin became a memory she was fond of. No, she needed something now, less intimate, a swift kill to merely set the craving back. Circling back the femmora paused, catching her mid pace, how long had she been performing the tedious acts? You are losing your edge, becoming one of them. A voice hissed, it's tone laced with what sounded like laughter. "No," Fiacre spat turning around as if facing the voice. "I shall never lower myself to those fools, my own ideas are spun away from their knowledge. As for my 'edge', speak for yourself, reciting your words like a broken record, deeming yourself fit to rule me." Glaring coldly into the distance, Fiacre's breaths came in hisses and growls. Ross listened as he heard growls coming from the direction Fiacre had disappeared off too. "Fiacre! Is she hurt?" He murmured quietly to himself, clumsily and not-so-quietly got to his paws. He hesitated, Fiacre would probably shoo him away with a snarl for wanting to help. But why did he want to help? Did it have to do with past encounters with his own troubles, or something else? Ross shook his head, puffing air through his lopsided jaw. He knew it didn't give him the most handsome appearance, but he had learned to live with it. Blinking his red and green eyes, Ross headed in Fia's direction, cautiously but quickly. "Fiacre, are you all right?" He asked gruffly, trying to seem like he didn't care to much about Fiacre. He thought he was doing a pretty good job of it. Golden orbs blazing, alight with fury, the femmora glared toward the space before her. She could almost see that worthless fool that impersonated her voice, it was mere wisps, no real image but it was there. A mockery it was trying to make of her, taunting her with its own amusement. Parting her jaws, the femme was about to speak, lash out, retaliate but another voice drifted to her auds. Sharply spinning around, the demoness was ready to tear into the intruder. She desired the head of whoever intruded the confrontation but it was too late. The voice was gone, its absent presence leaving behind silence. Had it fled given the chance, did the fates desire for her to battle this being? "Rossss," Fiacre spoke, slurring the 's' together as she noticed him emerging from the gloom. Her optics lingered over his build, examining his stature. His flanks seemed to rise a little faster, as if he had hurried to find her, or perhaps the little Snow White was still gone? The rage she had towards her intruder extinguished, as if being smothered to a dull burning. As she openly examined the brute, the demoness' optics narrowed. How much of the conversation had he heard when he ran over, or had he heard it at all. "My physique is well," Fiacre replied bluntly, unable to spin her regular web of indirect answers. How sweet, he cares, she thought. Drawing closer, a soft hum escaped her vocals. He drew her in like a magnet, she desired to know him, his secrets, what he stored away. Why did this brute come, did he care. "Like a shadow in the sky, you found me with little effort despite your belief of my actions," she spoke softly, her voice starched as she lifted her muzzle to his ear. "Why do you come?" Why find me dear, what draws you to this toxin? Ross gulped as Fiacre's tongue slowly slipped out his name like a snake. "Like a shadow in the sky, you found me with little effort despite your belief in what I do. Why do you come?" Ross just stared at her, jaws slightly ajar. "I-I don't know..." That voice, that silky sweet voice Fiacre directed at him. It nagged him so much. It always seemed like she was trying to tap into his piece of mind, to find out everything to turn on him. 'Stop trying to manipulate me!' He wanted to snarl, or at least growl. But he instead collasped heavily, holding on paw over his head. The large brute had a massive headache from all the stress and holding back his true self. This happened every once in awhile. Only Zanna had managed to coax him out of a few things, but not much. She hadn't dug deep enough inside his mind. But Fiacre, it seemed a sif she was delibaretly trying to decieve him, and he knew it. And yet, he found himself worrying about her, falling for her tricks although he knew the consquence in the end. Did he need a friend other than Zanna that bad? The demoness felt her onyx fur brush against the brute's dappled coating. He was so close to her, she could feel his heat, hear his heart but something was off. His smooth voice stuttered, curling in upon itself, he was struck by uncertainty, becoming a lost bird in a matter of seconds. This reaction was new to the femme, her presence never relaxed an individual, nor did it please one. From the moment her optics set upon the brute, she knew he was different, but how different she did not know until now. Then it was gone, the heat, the soft fur, vanished from her side. He had fallen to the ground, but why? Fiacre stood rooted, this reaction was new, was it another dramatic action like from before. No, this was true pain tormenting the brute. Lowering her muzzle, the demoness pressed her nose into his cheek. "Let go of the world, let it become something you stand upon," she whispered gently. The odd starch that leaked into her tone vanished to her surprise, leaving her tone genuine. "See the darkness unfold before you, let its cooling embrace calm you for a minute." What is this treachery you dare commit against me? The voice spat. "It is you, against it all," Fiacre spoke almost growling, her voice directed to two beings. "You cannot take over an individual but you cannot be ruled by the world around you. Find yourself, Ross, do not allow yourself to fall too far for the realm beyond is inescapable." Ross stared up at Fiacre with narrowed multi-colored eyes. "You're going to kill me anyway, what do you want to know?" He asked, the growl leaving his throat as he sighed in defeat. "I don't know why I keep falling for your tricks. Or why I worry about you, but I know my choices will only lead to the consquence you have been dying to have laid out for me." He said, spitting out the words. "I'm done being manipulated by you. I don't know why I trust you so much, and why I have ever been concerned about you, but I do know it doesn't matter in the end." He said coldy, looking away from Fiacre. "So do with me what you will." He growled, still avoiding her gaze. The demoness let out a short laugh and strode away from the brute only to return to her pacing. Fiacre's frame trembled as she continued to laugh inwardly at the brute's response. He thought she should kill him, perhaps for his words she should, the words he had morphed into his own truth. "You truly see so little of me, your sight restricted to the first moments you saw me, from that point on you trimmed away memories to form an image that pleases you, that fits your vision." Fiacre spoke flatly, an occasional growl struck between words as she spoke. "I attempt to ease your suffering for a moment, turn my personality into that of another and yet your mirror only reflects the past. Tell me Ross, when you speak to me, when you see me, do you only see a murderer?" Do you only see the being that claimed part of my mind, the one that guided many of my wrong doings. "Why do I trust you so." His words rang within her head, why did she trust the being within her skull, why did she crave Ross' presence, to hear him speak, why did she want to help him. Was she going mad to believe herself average? The path the fates laid out was never easy but this was beyond their norm, a realm they hardly ever desired her to see, the lands of a pack. Perhaps they knew what her capabilities were, what restrictions bound her to a plain she sought. If only you were stronger, you would had this over with, a voice chided as if making a point. As she spoke the last sentence, Ross whipped his head around and looked her dead in the eye. "No. You're wrong. I didn't see you as what I wanted to see you as, I saw you for what you are." He responded coldly, his gaze locked with hers intently. "And someone who went through what I did, that I could actually help." He said, searching her gaze wity aflicker of sadness and desperation. 'And something else...' He finished in his head. He couldn't tell her that though. Not ever. He had never felt farther from Fiacre, and yet he was standing right next to her. "I do see you as a murderer, but not as a murderer that kills others." He growled, ears flat and green and red gaze blazing with emotions. Fiacre took a step closer, her nose almost touching the brute's. "You claim to see me as a murderer, but who have you seen disappear from you without a trace, who have you seen die before your eyes. Have you felt the blood beneath your claws, striking back because you believe you should?" Fiacre's tone was rising, words flowing swifter as she spoke. Catching herself the demoness bowed her head, she had said too much, gone too far. "What murderer am I if I am not killing others?" She asked, her tone bleak. A hollowness arose within her, she felt as though the world had been stripped away, leaving her with nothing. What was this feeling, she despised it and yet could not feel hate. Dying a little bit? The voice inquired almost gleefully. "Why are you a murderer then?" He echoed, locking his gaze with hers. "Because you murdered..." He began, then saw the devasted look on her face. "I have gone through much worse then you..." He whispered, leaning down close to her ear. "But... nothing is more painful than watching you suffer." He said softly, stiffly pressing himself against her side in a sign of comfort. "And, I think I may know why I worry so much." He said nervously, shivering and giving a gulp as the realization struck him. He began shaking for a moment before the soft feel of Fiace's fur and her bitter sweet scent soothed him and he closed his eyes peacefully for a moment. Had he gone through worse? The secrets he locked away, trapping them beneath a cold shell, were those the experiences that haunted him just as they haunted her. She could hear his soothing voice in her lobes, the echoes of his vocals brought warmth to her, she did not know why. Stepping closer, the demoness pressed herself lightly against him, feeling his warm fur once more return to her own onyx coating. Burying the side of her muzzle into his fur she inhaled his sweet scent, letting it override her other senses. Being so close made her feel different, not weak but a new strength alighted within her. She did not want the brute to suffer any longer, his worries, his pain, she desired to vanquish them from his mind. "Why do you worry so when the consequences that attack you claw invisible wounds to your flesh?" Fiacre asked, her voice partially muffled by his fur. She did not want him to draw away, the thought of her forever soothed by his presence was irrational but she wanted to cling to him. Why do you worry about me, is it the same as I fear for you? Ross relaxed deeply as Fiacre decided not to draw away, but to press closer to him. "Because I..." He groped for the right words. He foun dthem, but was afraid of damaging his closeness to Fiacre. What if she didn't feel the same way? "I, uh, because we're friends." He finished clumsily, hoping Fiacre wouldn't say they weren't. He knew this would hurt him majorly, but he'd fight his way through it again if it led to that. He cared for Fiacre as much as he did Zanna, but, in a different way. "You can fight whatever is controlling you. You can be better than it, Fiacre." He murmured, reluctantly steping away from the female. "You are better than it." Friends, the singular word echoed throughout her thoughts. Is that what the emotions that prodded the demoness were, a mere form of friendship, or was it something else, another force that tugged her to be close with the brute. Sliding her eyelids down over her golden pools, Fiacre stood there silently, enjoying his warmth, his company. Once more his warmth vanished without a trace, he had stepped away from her, perhaps it was just friendships ties that bound the duo. Slowly opening her optics, she looked up into the mismatched eyes feeling as though she was searching for something within their depths but what she was looking for cleared the femmora's path. The only emotions, anger, sorrow, hate and emptiness was all she knew, there had never been a moment she saw more in an individual's eyes nor in her own. She could laugh but it was not joy that engulfed her, but a rather a twisted form of glee that only arose when she was hunting, playing, there was no chance of her being normal. Did the brute know of the voice that taunted her? His words almost seemed as if he did but how did he look past her shell to see it mocking her, perhaps he had heard her snap at the invisible being that shadowed her every move. "It has been with me for too long to remember when it approached," the demoness replied, "how do you fight a creature that is no element but the air itself, the wind that whispers and screams in the nights?" Did he hold the key for her to retrace the steps and undo her darkness. Or is it forever with me? Ross watched her ebony movements as she spoke. "Ignore it, it's what I did." He replied, winding himself around Fiacre, trying not to seem nervous. "Please try, if not for me, for you." He urged, touching his nose to the top of his head for a moment. "I want to get to know he real you." The Johta told her, his gaze softened. "I see much more potential in you than that voice does. It's only something there, reminding you that you did something wrong and you can't controlled. Telling you, that, that you are a monster." He stared at the ground, pain and a flash of insanity flashing in there, his blunt claws in the ground as memories flashed passed. Ignoring it, so simple, a method she never thought of. He had the voice, he had fought it off, but what was she without it? Solitude had ruined her, she knew so the moment the desire to kill set in but never seemed an issue after that until now. Beneath the voice, what was she, her personality was still there, would she still want to kill, would she finally understand the queer sense of joy? Questions buzzed through her head, each overlapping the first but then they all dropped. You need me, it hissed in her lobes, I keep you sane. Did she really need the voice, perhaps it was her security, without it would she be out of control. In the past is had restrained her from situations, kept her from becoming a corpse upon the ground. She had been alone then, but was she now? Something within Ross' tone when he spoke told her otherwise. Belonging, a thought she had long given up on arose. "I fear I am just that," Fiacre spoke glancing over at the spot where she thought the being stood. "Stripped of the voice I am a walking ghost, causing destruction with no real reason to move on or stay. A wandering soul that has been left to decay for seasons, is what lies beneath the surface." She could almost feel his pain as he looked down at the ground, the agony of a flashback, something she never would understand. Her memories that arose of the dead often made her laugh and hum with glee as she rewatched the suffering, would anything differ without the voice. "You were not a monster," Fiacre spoke. Her muzzle slipped beneath his maw and gently nudged it upward. "It is overpowering, taking over your every desire, the moment you accept it and it you the true self that you once were dies, becoming buried with a new layer of demands. The actions that you took were not you," Fiacre paused exhaling a soft hissing sigh, "the moment you fight against it is when you awoke from the nightmare." Ross looked at her as she began to speak again. "No, Fiacre. You are not a monster. You're just confused." He said, pressing himself into Fiacre once more, hoping she'd stay put. "Please, Fiacre. I-I need you..." He admitted quietly, closing his eyes and clenching his teeth. He may as well prepare for the worst, why would Fia feel the same way? He knew he didn't look appealing, nor was his personality. Besides, he knew all to well she could do better than him. He dug his face into his shoulder, trying to conceal his crooked jaw. "Who am I kidding?" He asked himself quietly, his breath slightly ruffling Fia's ebony fur. Within her chest, the demoness felt her heart pound loudly, each beat pulsing in her lobes as she heard his words. It almost seemed her heart had quickened, breaking into a light jog. She felt him shift, as if trying to hide himself within her fur. Allowing herself to press closer to him, she closed her eyes enjoying the sound of his vocals. "I need you," she whispered back, burrowing her muzzle into his fur once more. "Ross, please don't let me go." I fear my heart would break without you, she added in her thoughts silently. She never felt so dependant upon anyone, it almost seemed like her one reason of staying was him this entire time. Would he repel from her? Laugh and make a mockery, claiming he has tricked her. All she could do was hope. Falling a little fast, a voice inquired. Perhaps, she replied silently, but she did not care for the consequences, as long as he was there a little longer. Ross sighed in relief at Fiacre's words. "I won't, I promise." He breathed, enjoying Fiacre's gentle touch against him. Should he really trust that what she said was true? Somehow, he knew he could. Ross would ask the question, eventually, he needed to be sure Fiacre really did need him. He sat dowb, but still kept himself close to Fia as he relaxed. "I'll always be there for you." He murmured.